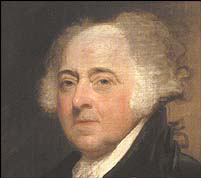 John Adams was born in 1735 in the Massachusetts Bay Colony. He was a Harvard-educated lawyer, and a delegate to both the First and Second Continental Congresses. A leader in the independence movement, he served diplomatically in France and Holland during the Revolutionary War. He was instrumental in negotiating the Treaty of Paris, which ended the Revolutionary War. After the war, he served as minister to the Court of St. James, and then George Washington’s Vice President before becoming the second president of the United States. On March 6, 1789, President Adams called for a national day of fasting and prayer for the country could "call to mind our numerous offenses against the most high God, confess them before Him with the sincerest penitence, implore his pardoning mercy, through the Great Mediator and Redeemer, for our past transgression, and that through the grace of His Holy Spirit, we may be disposed and enabled to yield a more suitable obedience. . ."
A few other quotes which demonstrate Adams’ thoughts about Jesus are below. "We have no government armed with power capable of contending with human passions unbridled by morality and religion. Avarice, ambition, revenge, or gallantry would break the strongest cords of our Constitution as a whale goes through a net. Our Constitution was made only for a moral and religious people. It is wholly inadequate to the government of any other." "The general principles on which the fathers achieved independence were the general principles of Christianity"